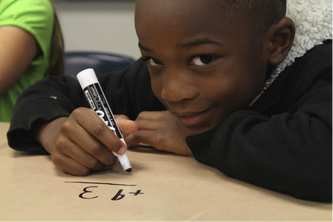 We are seeking rigorous Common Core math aligned assessment items to add to our site. These items must be unique and require students to think critically and strategically. Applying to this project involves submitting a rigorous assessment item that you have already created for use in your classroom, as described below. If accepted, we will ask you to complete a short project based around this item. Please do not submit a description of a lesson plan, project, or teacher explanation. ​If you are interested in completing a project, click the Apply Now button below to review the list of standards we are seeking for grades 3-5. Please submit a proposal to any standard in which you are interested by clicking on the 'Link to Apply' for the relevant standard(s). You are welcome to apply to multiple standards. Please be aware that proposing a project is no guarantee of pay. Your item submission must be accepted, and you must complete the assigned project in order to receive payment. Please read through this sample of a recently accepted rigorous math assessment item submission to get an idea of what we are seeking for this project. Ready to apply? We can't wait to hear from you!